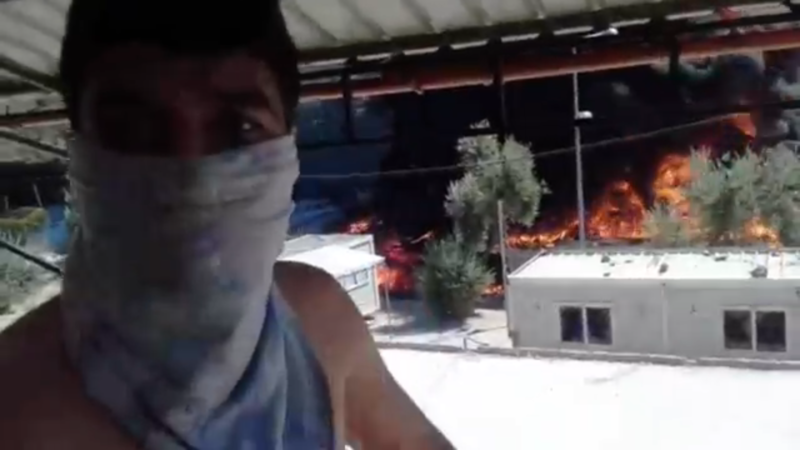 MORIA, Greece— A riot and fire today tore through the Moria migrant camp on the Greek island of Lesbos. Moria camp is the primary reception center for refugees who land on the Greek island of Lesbos, just five miles from the Turkish coast. Princeton University journalists who were working outside the camp Monday afternoon heard explosions. Migrants could be seen in the distance hurling stones at metal housing containers, and a column of black smoke billowed about 15 stories high, blocking the sun. Videos and photos taken by migrants inside the camp, and obtained exclusively by the journalists on the scene, showed several structures were gutted. At least two persons were seen collapsing just outside the camp and were treated. One migrant explained that tensions erupted between a group of migrants and the non-governmental organization Euro Relief. Others claimed that the riots were in line with previous disturbances at the camp, in which migrants protested against the dismal conditions and stagnant registration process. During interviews in the days preceding the event, camp residents complained about overcrowding, inedible food and violence within the camp. “They burned the camp because (authorities) don’t want to let people go,” Dandeen Matoko, a Congolese migrant who has lived in Moria for eight months, said in an interview while the disturbance continued on Monday. “They are keeping people here, we are not sleeping nicely, we are sleeping on the floor, other people are sleeping without covering themselves. At one point, a squad of uniformed men bearing clear riot shields walked into the camp in formation. Fire trucks approached the gates of the camp, which is circled by coiled razor wire, but did not enter. One migrant collapsed outside the camp gate and others splashed her face with water. A man groaned on the ground before being carried away down a two-lane access road. The camp houses more than 3,000 refugees, far beyond the capacity it was built to hold. There were no official reports of casualties in the incident. Who is a Greek? For How Long? ATHENS — Greece is one of the most homogenous countries in the world. Numbers tell the story: A 2011 national census found that 93 percent of the citizens of the Hellenic Republic described themselves as ethnically Greek. A full 98 percent of the population identified its religion as Greek Orthodox. And 99 percent of citizens listed their primary language as Greek, according to the most recent government data available. For as long as most Greeks can remember, this uniformity has been central to the country’s identity. But since 2011, the resident population of Greece has been changing rapidly, and today those changes are beginning to look permanent. SIngers in a 1000-voice choir hold flashlights and perform the music of Mikis Theodorakis in honor of the composer’s 92nd birthday. ATHENS, Greece — On June 19, nearly 50,000 Athenians turned out to pay tribute to Mikis Theodorakis, a renowned composer and icon of Greek revolutionary nationalism, at a concert held in honor of the composer’s 92nd birthday. The next day, activists with the Greek Paraititheite movement rallied outside Parliament, calling for the government led by Prime Minister Alexis Tsipras to step down. Together, those outwardly unconnected events highlighted themes of revolution, resistance and perseverance that are central to this ancient city’s cultural and political identity. Theodorakis, with his wild, shock-white hair and imposing eyebrows, is Greece’s foremost composer. He also is a political icon for left-leaning Greeks. Theodorakis was detained during the Greek civil war in the 1940s, according to an interview with The New York Times, and the music he composed grew increasingly political in the decades that followed. Theodorakis regularly drew themes or lyrics for his music from classical Greek poetry and, during the military dictatorship from 1967-1974, he and his music were banned. Theodorakis later was elected twice to parliament under the Communist party. 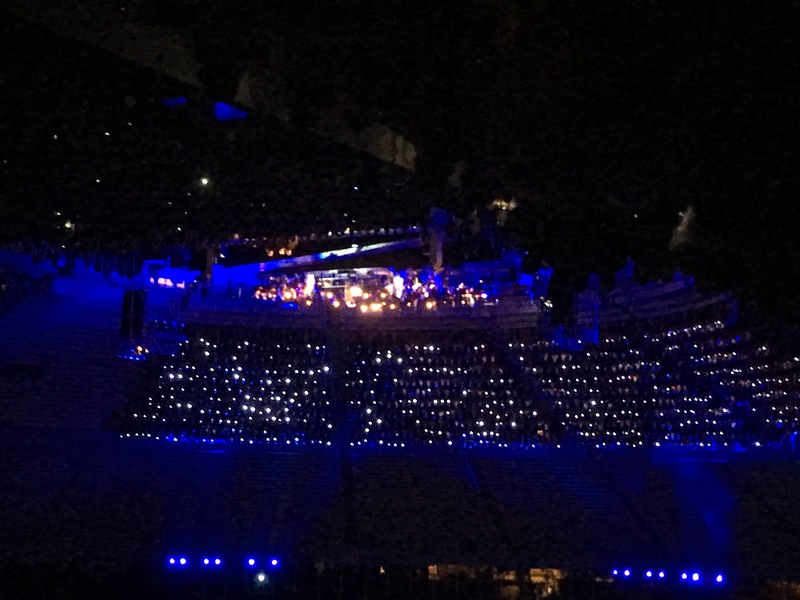 The Greek National Opera organized the June 19 concert, called “1000 voices honor Mikis Theodorakis.” The audience nearly filled Kalimarmaro, the marble stadium that was constructed for the first modern Olympic games in 1896. The massive choir and a full orchestra performed Theodorakis’ music for more than two hours. The crowd swayed in synchrony. Young children and elderly men alike hummed along with the starting notes of each song. One composition, Tο παληκάρι έχει καημό (The Heartbroken Boy), with words by poet Manos Eleftheriou, spoke of a young unemployed man who could not afford even a cigarette, yet “his eyes are two birds” and he lived with hope. “Resign” movement members at Syntagma Square in front of Greek Parliament on June 19. The next day, it was the Paraititheite movement’s turn. The group, whose name means “resign” in English, represents a more conservative version of political engagement and resistance in Greece. The group blames Prime Minister Tsipras and the Syriza party for the economic collapse of the last few years. Catiforis, who wore a neat checkered shirt and sunglasses perched atop his salt-and-pepper hair, explained that most of the Paraititheite advocates are new to political action. Although the Paraititheite protests and Mikis Theodorakis’ music do not seem initially comparable, the two share a focus on empowering citizens to speak and think about the forces that affect everyday life in Greece. Although Theodorakis supports socialists and the Paraititheite advocates would prefer a center-right approach, both show that in Greece, culture and politics work best when working in tandem.